Are you feeling inspired? Thinking about dressing as Veronica Webb for Halloween? How about Heidi Klum? Jay McCarroll? We'd love to see photos! More Halloween ideas from Nick Verreos are on the TVGuide Channel's Fashion Team Program. You can watch the entire episode on Nick's blog. It is really great. Have a safe night, BPRs! Here is a link to Episode Four of Project Runway Canada. Alison Kelly's designs are available by special order. This includes her jewelry as well as her clothing. She was recently featured in Daily Candy. Click here for more information. Thanks Alison. 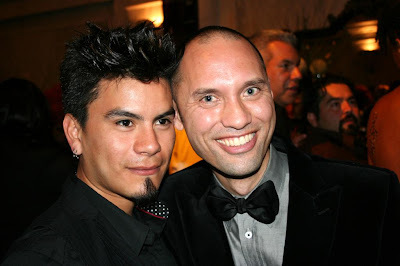 There is a lot of hype surrounding the premiere of Project Runway Season Four. I know that BPRs are very informed already and I do not usually include a link unless it includes new information. This one is fun. Heidi admits that there is one designer she is "totally rooting for." Who is it? Any guesses? Be sure to vote in our poll! No RTTR for Season 4! Project Runway Season 4 will premiere on November 14, but not like we were expecting. Bravo confirmed with us today that there will be no Road To The Runway episode. The premiere will jump right in to the first challenge; we'll have to wait and see if and how they incorporate the designer auditions into the show. We're disappointed. We love watching the audition process, seeing the previous season's designers again, the whack-a-doo wannabees and the close misses. We especially loved the round table on the Season 3 RTTR between Tim, Nina, Heidi and MK as they perused the designer's portfolios. It helped give us a feel for what to expect from the new cast and built excitement for the first challenge. How will we be introduced to the new cast now? This weekend my designer daughter Stephanie, her construction specialist Aunt Lisa, my wife, Sylvia, and I went to Mood Fabrics in the heart of the Garment District in New York City. Soon after we arrived, Laura Bennett came in to pick up an order. In person Laura was delightful to speak with. Laura took time to speak with Stephanie, pose for a picture and gave her some tips on sewing for a 10 year old. Stephanie spoke to Laura about making a sequined jacket. For sewing sequins, Laura recommends removing the sequins from the seam allowance then re-sewing the sequins in by hand. Sewing machines do not like to sew over sequins. Priceless information and good advice for a 10 year old and the parents who will help with the sewing! Laura does not dress down just as she said in the beginning of Season 2 and looks stunning in person. I jokingly apologized for wearing jeans. My wife, Sylvia, talked to Laura about her boots. Sylvia adores Laura’s boots and mentioned what a difficult time she has finding boots that fit. Laura provided the perfect solution – riding boots – they come in a variety of widths. Stephanie is taking horse riding lessons and we talked about that for a while. Laura told us that she herself rides horses and her daughter is an accomplished rider. We chatted briefly about her life as a recognizable personality. Laura told us that she likes meeting fans of the show especially children. Then Laura was off to take care of business. Thank you Laura for a great time and Love to the family. BPR thanks Los Angeles-based Field Reporter Jonathan Trimm and his wife Alitia for this excellent article. 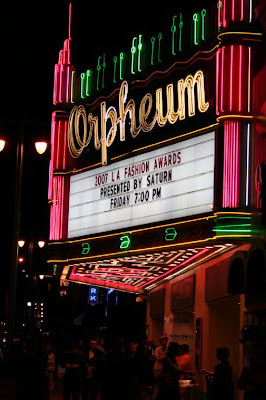 To end the LA Fashion Week, the city gathered at the Orpheum Theatre in the Fashion District downtown. The event began with a cocktail hour that included some of the most important names in Los Angeles fashion. Some of those people milling around the theatre were PR alum, including Nick Verreos, Andrae Gonzalo, Raymundo Baltazar, Bradley Baumkirchner, and Vincent Libretti. ETA: More photos of the event at Getty Images. Enjoy! Heidi Klum was at the Victoria's Secret Store in The Grove yesterday to introduce her new line of makeup. After her appearance on Oprah Thursday with her charming husband, the internet has been buzzing about what initially attracted her to Seal. 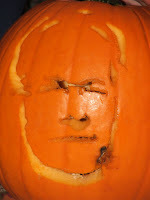 Jaime's friend Jackie carved this Tim Gunn pumpkin. Happy Halloween! This article about the recent Toronto Fashion Week contains some interesting observations about the Project Runway Canada judges. Malan Breton's biggest fan, Maddie has started new blog called Glamalan. It's "All Malan - All The Time"
Don't miss the latest from Project Dollway. The second challenge is up! Los Angeles Field Reporter Jonathan Trimm attended the Los Angeles Fashion Awards Show last night. 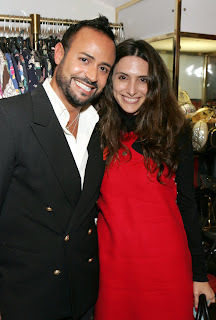 Project Runway was honored with the "Inspiration" award and Season Four's Rami Kashou was nominated for a "Fashion Innovator" award. Jonathan spotted Nick Verreos, Raymundo Baltazar, Andrae Gonzalo and Vincent Libretti. He also interviewed Rami. Stay tuned for a full report! Heidi Klum will be at the Victoria's Secret Store at the Grove TODAY from 5:30 - 7:30. Please send us photos if you go. Tim Gunn moderates a fashion show here to introduce the new line of Liz Claiborne Tech Accessories. Tim also was on hand at an event to preview the collection at the 900th Best Buy store. Nick's blog has an update on "What happened to Andrae?" This article describes how the Slice Network in Canada is using their website to promote Project Runway Canada. Long live the internet! Rondi has posted her recap of the third episode of PRC. Thanks Rondi. BPRs, if you know of any other recappers, please let us know. We would love to have a Recapalooza of the Canadian Show. It seems that interest in Canadian fashion has never been stronger - thanks to Iman and Project Runway. Just in case you miss Heidi Klum and Seal on Oprah today, here is a link to the article on Oprah.com. Here is an article about Carlie Wong from Project Runway Canada. The Wall Street Journal has an interview with Tim Gunn. Dallas is claiming Marion and Elisa. Here is the video that you've seen on TV. The music is 'Watch Us Work It' by Devo. This song is also used to advertise Dell Computers. Last year we asked you to vote on the 3 designers that you thought would make it to Fashion Week. You told us Angela Keslar, Katherine Gerdes and Robert Best were likely to send their designs to Bryant Park. It's three weeks(!) to the premiere of Project Runway Season 4. There's a lot of information out there but the fans haven't seen a single episode. You've got promos, websites, hype and buzz to go on along with instinct. Some of you know the contestants. But in the end it's about the fashion created by designers and personalities working under pressure unlike anything they've experienced before. In 3 weeks the poll will be closed. We'll tell you on November 14th your choices. The exit interviews play first (sorry!) and then the full episode begins. You don't have to reload or refresh anything. Enjoy! With only three weeks remaining until the premiere of season 4, Bravo inexplicably has not released any information on the models.The poor girls don't even get paid; don't you think a little promotional help is in order? Here is an article about Tim Gunn fitting jeans in Winston-Salem. The finale fashion show for Project Runway Canada was held last night at L'Oreal Fashion Week in Toronto. Yes, Iman was there. We are continuing to check Slice for the latest episode of this fabulous show and we will let you know as soon as it is available. Meanwhile, Malan Breton is in Dallas preparing for his show tomorrow night. Missouri State University is planning a Project Runway event for their Homecoming Week. Here is a little more information about the Project Runway Season Four Designers' Fashion Show on November 6th. TiVo alert: Heidi Klum and Seal will be on Oprah on Thursday. Finally, at the end of this article there is a great quote from Tim. Thanks Pat, Desertwind and everyone who sent us this link! Bradley's collection was inspired by "Bach, Ballet and Little Girls' Dresses." BPR thanks Los Angeles Field Reporter Jonathan Trimm for his excellent coverage of Bradley Baumkirchner's Show last Friday. Thanks also to Bradley for inviting us. Chloe Dao joined Nick Verreos at the Vintage Fashion Roadshow. All photos are from Evans Ward. Nick is showing one of the gowns from his Spring 2008 collection (the final "wedding gown") which was inspired by a vintage Balenciaga one. 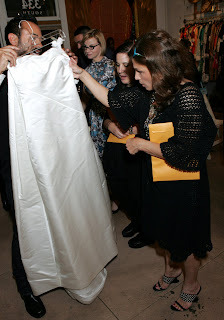 He is showing it to celebrity stylist (Madonna's stylist) Arianne Phillips (in the middle) and Doris Raymond (at the right.) 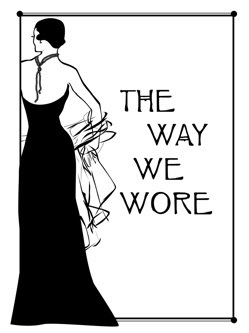 She is the owner of "The Way We Wore". Los Angeles-based Field Reporter Jonathan Trimm was at Bradley Baumkirchner's Spring 2008 Show on Friday night. Here is a sneak peek at one of the designs. He also met Nick Verreos and Vincent Libretti at the Show. Watch for a full report tomorrow. Thanks Jonathan! Project Runway Season Four Fashion Show! Now this sounds like fun! On November the 6th at 12:30 at Lincoln Center you can see a Fashion Show featuring designs from the Season Four designers! Please let us know if you can attend. Tim Gunn will be at the Belk at Hanes Mall from noon to 4 p.m. on Saturday October 20th to help women find the right pair of jeans. Winston-Salem is one of six cities on The Liz Claiborne and Glamour Denim Tour. For more information, go to DenimTour.com. 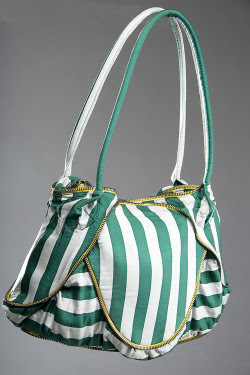 Would you like to win this bag? Redbook magazine is running a sweepstakes contest for this Jeffrey Sebelia design. No purchase necessary. Please let us know if you win! Brooklyn Fashion Weekend starts tomorrow night. Here is Rondi's Recap of the second episode of Project Runway Canada. This is really a great show and the PRCanada website is awesome. E! 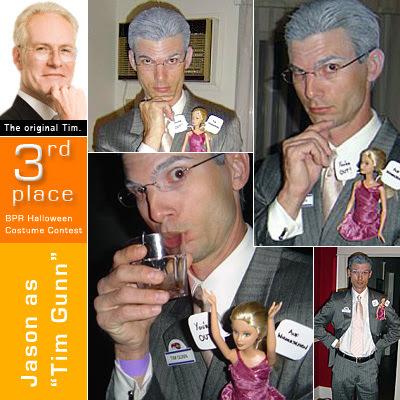 Online has an article about "Tim Gunn's Guide to Style." Thanks Erik. Also, Tim Gunn and Daniel Vosovic share their "coming out stories" on Outzone. Thanks Bonita. Amanda told us a couple of weeks ago that she had just been part of a music video from Duran Duran. Click here for a link to the video. The song is called "Falling Down." Thanks Karen. Scottsdale Fashion Week is November 1-4 at the Scottsdale Waterfront adjacent to Scottsdale Fashion Square. I am definitely looking forward to this event and I would love to meet some local BPRs there. Please let me know if you are able to attend the event on Friday night, November 2nd. Thanks! Slice is now featuring their Project Runway Canada episodes in a format that can be viewed by our readers here in the States. Click here to watch the full episode 2 for a limited time only. Thanks, Carl. Did you miss Episode 1? Click here. Thank you Danielle, for your awesome field report and photos from Baltimore. In his speech, Tim mentioned that the crowd was the largest yet to turn out for one of his appearances, and he was very genuine in his expression of gratitude. 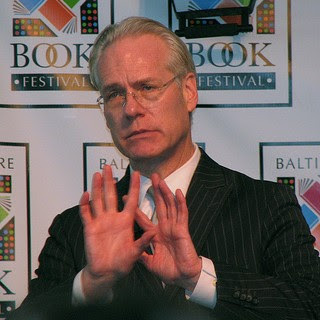 He spoke about the history of the book and its natural evolution into the "Tim Gunn's Guide to Style" show. Then he dished a bit about behind-the-scenes moments at Project Runway 4 and his own show, and answered fashion questions from audience members. He was charming, funny, witty and altogether wonderful. Click here to bid on Laura Bennett's "Woodstock" dress from the "Snoopy in Fashion" Show. All of the proceeds go to Dress For Success. This LA Times article describes the success of LA Fashion Week. Here is more from Los Angeles. My husband and I visited Emmett's studio on the last day of our trip to New York. It was the first time I had seen it and I was really impressed. Emmett's co-designer, Erin was there to greet us and gave us a quick tour of the space. They are working on the EMc2 Holiday line and had a couple of sample garments made up. I didn't want to reveal these too soon! The next two would be great for New Year's Eve. The dress on the left is white with metallic silver and the dress on the right is a little bit stretchy with a metallic gold thread in the fabric. It was really fun to see the actual workspace where Emmett and Erin design the garments for the EMc2 collection. Thank you both for your kindness and hospitality. As most of you know, we have a strict "no spoiler" policy at BPR. But so many of you are writing in about the story in this morning's New York Daily News that we are going to provide the link in the hopes that those who don't want to see it can avoid it in the comments. Again, please do not put links or spoilers in your comments. The show is much more fun if you don't know what's going to happen. This article contains several potential spoilers regarding Season 4, so you've been warned. For those still curious, here it is. Lucky Canadians get to watch the second episode of their edition of Project Runway tonight. Meanwhile, the first episode is available here. Thank you Sneersucker and MissRoyalT. Update: Here is a news article about the show and an interview with Carlie. Malan Breton will be showing his Spring '08 colection on Friday, October 19th at The Tobacco Warehouse in Brooklyn. More info here. Bradley Baumkirchner is showing his Spring '08 Collection on October 19th at The Besant Lodge in Beachwood Canyon in the Hollywood Hills. It's an old 1930's theater. RSVP to EM Productions (323)692 2878. 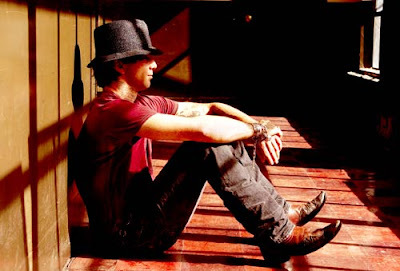 The doors open at 8:00 for libations and show is at 9:00. 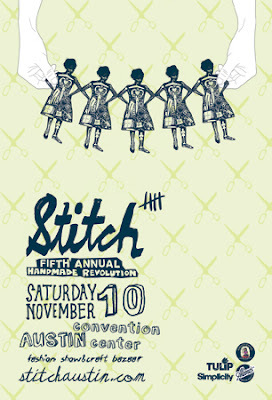 Bradley will also be at Stitch in Austin Texas on November the 10th. Please let us know if you are able to attend. Thanks! Nick Verreos had a great time in Chicago. Click here to watch a video from the premiere party for "Tim Gunn's Guide to Style." Here is a feature about the make-up styling at Jeffrey Sebelia's Show. More about Rami Kashou here. Read Rondi's Recap of the first episode of Project Runway Canada. Thanks Rondi. Canadian BPRs please continue to send your links and articles about the show. Check out the designs from the first challenge at Project Dollway. BPR Field Reporter Christine H attended Jeffrey Sebelia's Cosa Nostra Show last night and sends us this fabulous report. Thank you Christine! Last night my husband and I went to see the Spring/Summer 2008 Costa Nostra by Jeffrey Sebelia show in downtown LA. First off, I feel so lucky that my favorite Project Runway contestant happens to live in the same town as me, so I am able to catch his shows. Thanks Jeffrey, and please never leave us for New York! Here is a little preview of the full report to come. This is one of Jeffrey's designs from last night's show. Click here for more of Christine's photos. Recognize anyone in the audience? 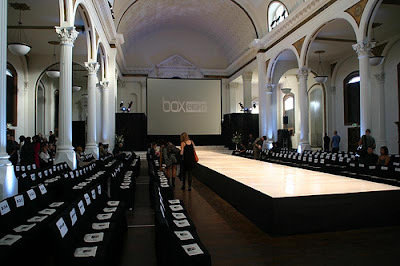 To learn more about LA Fashion Week click here for a Los Angeles Times article. Thanks Patrick. A quick update for our TGGTS Party fans - no new episodes are scheduled for Tim Gunn's Guide To Style through at least November 8. Our fabulous Bravo friend Bonita Lynch tells us: "We're not sure yet when exactly remaining Guide to Style episodes will air, but it will return as a compliment to Project Runway." We're guessing that means November 15. Is there some re-tooling going on behind the scenes? Stay tuned. 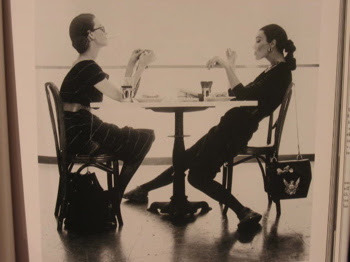 Meanwhile, don't miss tonight's rerun of TGGTS featuring BPR friend and commenter JeAnne Swinley. We think it's the best of the series so far, and not just because we love JeAnne (we do). Jeffrey Sebelia will be at Boxeight's "Have Faith in LA" event tomorrow night at Vibiana's. Read more about Downtown LA's Fashion Week here and here. 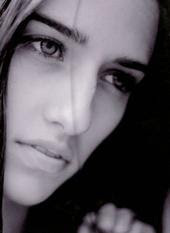 We have met another Project Runway Season Four model and her name is Lisa. Thanks BPRs! Please continue to send us your news. Dear Canadian readers, please continue to send us the news and links to Project Runway Canada. Is this available on YouTube or iTunes? I couldn't find it - please keep us posted. If there is a Canadian version of BPR we would love to link to it. Meanwhile, here are more articles about the premiere - it seems that everyone agrees that Iman is fabulous and the show is off to a great start. Check here, here, and here. Did you know that Holland also has a Project Catwalk? 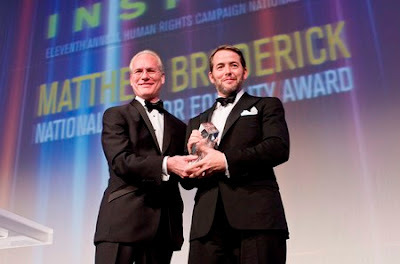 Tim Gunn presented the "Ally For Equality" award to Matthew Broderick at the HRC's 11th Annual National Dinner on Saturday night. And fashion isn’t always pretty! “Project Runway Canada” began with a bang. Thirteen designers from across the country met at Toronto’s Harbourfront and were welcomed by their mentor, Canadian designer Brian Bailey, and host Iman, who glided in to meet the lucky thirteen on a luxury yacht. But the drama started right away: as the lucky thirteen boarded the yacht, they were informed that they had 30 minutes to design an outfit that best expressed their design aesthetic, using only four yards of plain white jersey, one yard of gold trim and simple tools. Men’s wear designer Tyler from Toronto was the first fashion victim, as voted on by Iman and Brian Bailey. Click here to continue reading Jimmy's recap of PR Canada Episode 1. Season Four model, Amanda already has a Project Runway connection! Here she is modeling for Malan Breton. Thanks BPRs. BPR sleuths have turned up three of the models from season four and of course we would like for you all to meet them! BPRs, please let us know if you are aware of any of the other Season Four models. Thanks everyone! 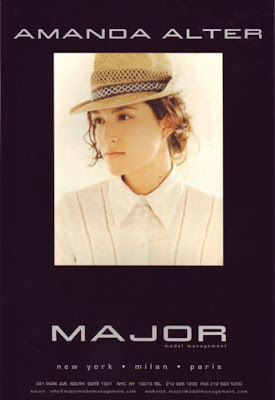 From Indigo TV posted on MySpace. The re-introduction and re-interpretation of past fashion winners in today’s world. With Special Guest Panelists Elizabeth Stewart of The New York Times, Costume Designer Arianne Phillips, & Fashion Historian Louise Coffey-Webb. In the style of the “Antiques Roadshow” you’ll have an opportunity to have your favorite vintage apparel or accessory item appraised by Doris Raymond…a $100 value!